We are a team of Multi Award Winning Furniture Designers and Makers based in Sheffield. We offer bespoke furniture design and manufacturing services to businesses, museums, galleries, universites and private clients nationwide. We specialise in the production of furniture, prototypes, products, hand built kitchens and solid wood timber structures. We work with a vast range of materials and processes, utilising some of the latest 3D CAD packages along with a fully equipped workshop to produce our projects in. We own and operate a state of the art 8 x 4 ft CNC machine which we use to cut sheet materials and machine 3D parts for our projects. We are a team of Multi Disciplinary Designers and have a range of skills and industry contacts to provide a full turn-key design and manufacturing process for your projects. After studying Furniture Design at Sheffield Hallam University, Ollie carved a career for himself by following his passions and opportunities. This path has involved property development, product design and construction, but now firmly sits focused on producing outstanding bespoke furniture. 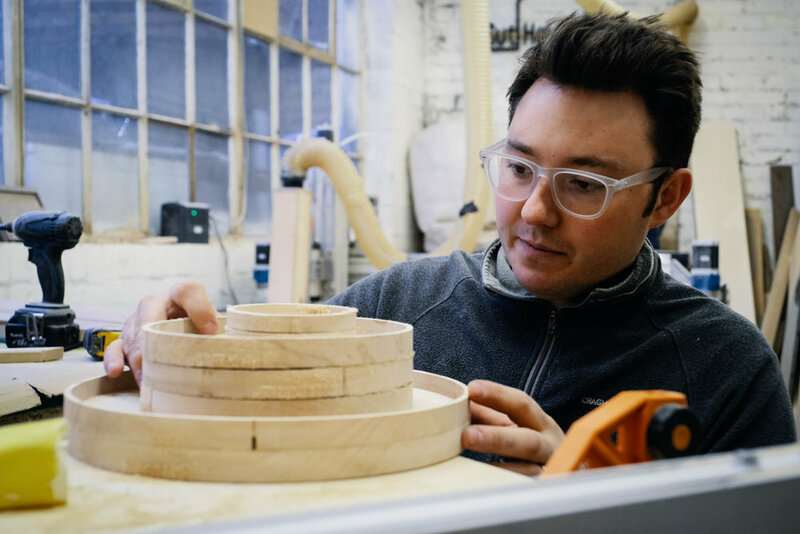 With a long term fascination for creating, imagining and developing furniture and products for the home, Ollie has built a workshop packed with tools and new technology to help realise these ideas. Ollie was voted Young Tradesperson of the Year 2017 and Carpenter of the Year 2017. Ollie lives in the Peak District a few minutes drive from the leafy city of Sheffield, with his Award Winning Wife in the form of Jewellery Designer Jessica Flinn. He is a proud Dad to two amazing children, and the family Dog, Moss the Border Collie. Ollie is often found in the workshop, covered in sawdust with a head full of ideas. Typically joined by his faithful sidekick Moss, tennis ball in mouth ready to help. Andy Dunham works with Ollie and has been influential in various projects for the past 6 years. Andy has a wealth of engineering and fabrication knowledge and trained as an Engineer in the 1980's in and around Sheffield and South Yorkshire. Andy also studied at Sheffield Hallam University and has a degree in Metalwork and Jewellery, producing his own collections and commissioned works when not in the workshop. Andy's passion is most definitely making, he is happiest with a tool in hand and something to get stuck in to, along with a good cup of Tea. Andy's skill set is a vital component in the delivery of our projects and He continues to innovate how we use the workshop and the tools within it. We are a team of Multi Award Winning Furniture Designers and Makers based in Sheffield, UK. All of our work is Handcrafted and made by us, in our workshop in Sheffield. We have spent the time researching our materials and perfecting our processes, we love to work with clients who want outstanding and unique pieces of furniture. We have designed and made furniture for museums, galleries, universities and private clients nationwide. We specialise in Dining Room and Board Room Tables, Birch Plywood Cabinetry and Bespoke Kitchens. We will work with you to understand what it is you need from the piece or collection of furniture. It may be extra storage for the home, a beautiful Handmade Kitchen using locally sourced hardwood, or cabinetry to display your collection of records and fancy music equipment or a table to fit that extra 4 family members who need a place to sit on Christmas Day. We work on a commission basis to design and build the perfect piece of handcrafted and lovingly made furniture to suit you and your home. We work with a vast range of materials and processes, utilising some of the latest 3D CAD packages along with a fully equipped workshop to produce our projects in. The timber we choose ranges from Native British hardwoods milled locally and air dried, all boards having been selected for their uniqueness and beauty. Right through to American Black Walnut for its rich and deep texture, to Birch Plywood for its great properties in cabinetmaking and subtle pale grain patterns. We own and operate a state of the art 8 x 4 ft CNC router machine which we use to cut sheet materials and machine 2D & 3D parts for our projects. We are confident that we can deliver perfect quality furniture to suit your needs every time, please take a look at our work and get in touch to discuss your next beautiful piece of furniture. For CNC work please visit our sister company CutHouse where we can provide a full service B2B cutting service in a host of sheet materials. After studying Furniture Design at Sheffield Hallam University, Ollie carved a career for himself by following his passion. This path has involved property development and product design, but now firmly sits focused on producing outstanding bespoke furniture. In 2018 he received a Civic Award from the Lord Mayor of Sheffield. Ollie lives in the Peak District a few minutes drive from the leafy city of Sheffield, with his Award Winning Wife in the form of Jewellery Designer Jessica Flinn. He is a proud Dad to two amazing children and the family Dog, Moss the Border Collie. We have our own in house team of skilled cabinet makers and craftsmen who work alongside Ollie to complete our projects. Together we span the disciplines of Art, Jewellery, Industrial Design, Welding, Fabrication, Engineering, Forestry, Interior Design, Digital Manufacturing and Traditional Cabinetmaking.